Martin Joseph Gabriel, also known as “Big Manny,” was the son of Narcisse Gabriel. He was born in New Orleans in 1876 and played the accordion in his early years. He worked as a mason, tinsmith, roofer and general laborer. Big Manny switched from the accordion to the cornet in about 1907 because that was the popular instrument of the day. Cornet players such as Buddy Bolden, Bunk Johnson and Manuel Perez were popularizing the new jazz sound. Big Manny attracted numerous musicians to jam sessions and rehearsals at his home. King Oliver was known to hang around the Gabriel house. Big Manny also led The National Orchestra of New Orleans from 1913 until he died in 1932. His son, Martin Manuel Gabriel “Little Manny” played his first jobs on drums with his father’s band. Well-known players from this scene such as the cornetist Freddie Keppard and banjoist Johnny St. Cyr worked with Big Manny, as did a gaggle of Gabriel kids and their father’s cousin, clarinetist Albert “Dude” Gabriel. 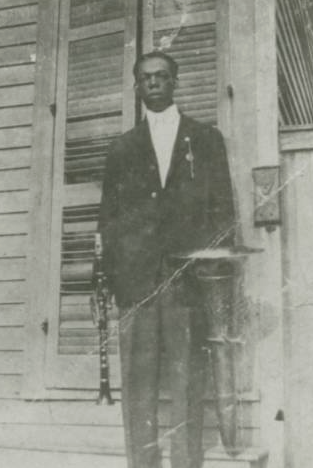 Clarinetist Albert “Dude” Gabriel played with Tom Albert in 1910, and with the Pacific Brass Band from 1910-1912. He also played with some ragtime bands around this time with Manuel Manetta. Commonly known as “Dude” from the band stands. One of his addresses is listed on the self-guided walking tour in the Algiers neighborhood in New Orleans.